Ever since their inception, cruise ships have an associated glamour, from their livery right through to the elegant outfits worn by guests on board. In recent times, the appreciation of aesthetics has stepped up a notch, with architects and interior designers tasked to create Instagrammable spaces to vie with some of the world’s best boutique hotels. To really make a statement, some companies are investing in art, and what started as a few pretty pictures hung on walls has transformed into collections worthy of gallery status. Launching in summer 2019, Saga Cruises’ newest ship, Spirit of Discovery, is devoted to British arts. With work from over 40 artists either born or based in Britain, the bespoke-built luxury ship will showcase the largest exhibition of British works at sea. Information on the artists’ backgrounds will support self-guided tours of the collection, which will include a mixture of permanent and temporary works. There are plans for visiting artists to lead on-board workshops, allowing passengers to create their own masterpieces at sea. As a taster of what’s coming up, these are some of the artists whose work will be displayed on Spirit of Discovery. Commissioned to create pieces of art for The Living Room, Spirit of Discovery’s bar area, London-based artist Ewan David Eason has developed intricate golden maps of five places that have special personal meaning to him: London, Bath, Canterbury, Glasgow and Southampton. By gilding with precious metals, he focuses his viewer on the sacredness and diversity of our living landscapes – in this case, central London. Eason believes in art as documentation, a snapshot of an ever-changing world that could be completely rewritten in just a few years’ time. 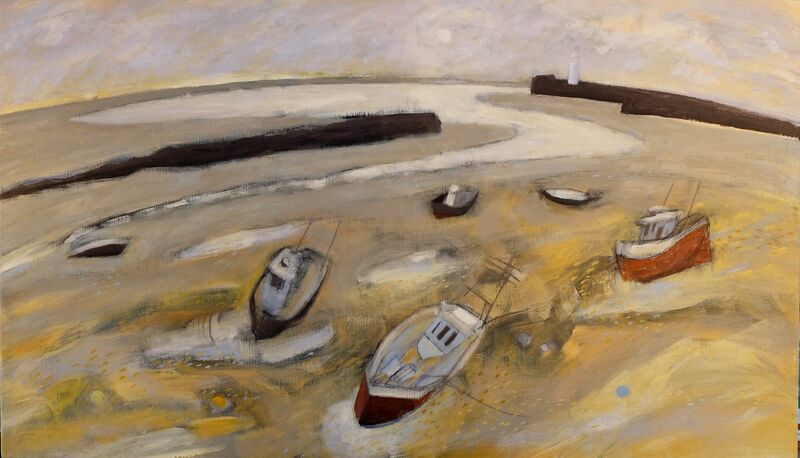 Abstract landscape artist Beth Nicholas will be providing artwork for Coast to Coast, a seafood restaurant offering British and locally sourced delicacies. Her pieces are figurative ink drawings that emulate the transience of the seashore. Although it’s the first time that Nicholas’ work has been used at sea, she is no stranger to commissions from luxury brands, including Hilton, Christian Louboutin and Bombay Sapphire Gin. 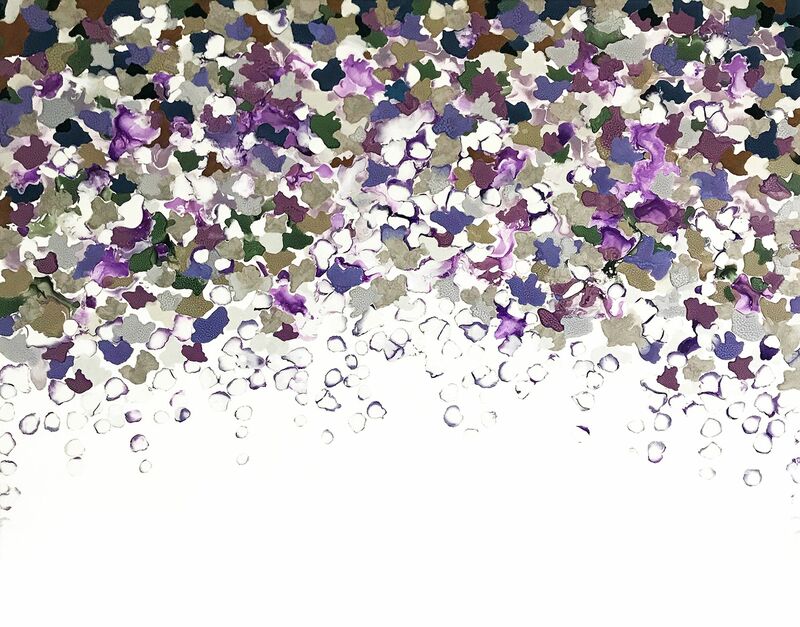 Based in north-west London, Corinne specialises in abstract mixed media paintings, and her work in the Grand Dining Room evokes British fauna and flora across the seasons. Using texture and colour, the paintings are emotive and dynamic, giving an energy to the ship’s elegant main restaurant. Born on the Clyde coast in Scotland in 1949, and now based in Dorset, Colin Moore worked as an architect and then creative director for international design consultancies. 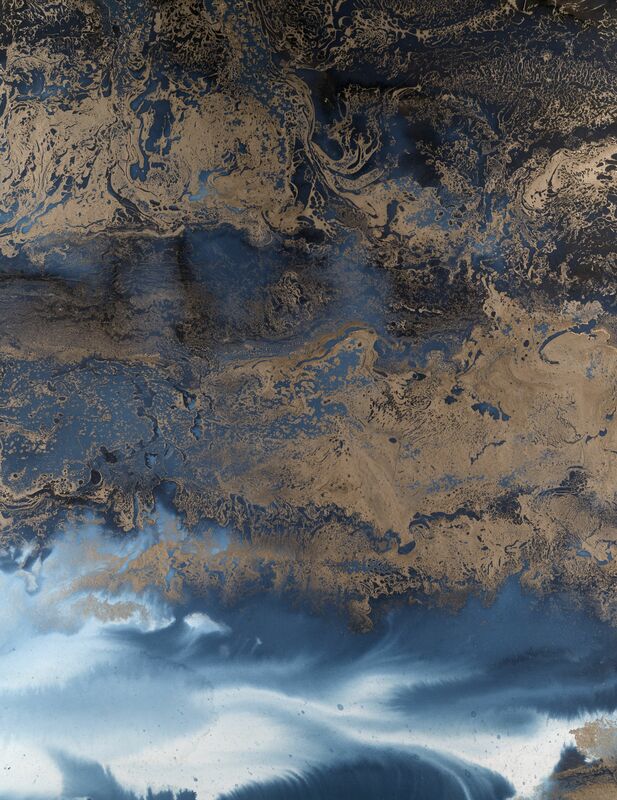 After retiring in 2004, he devoted himself fully to art, and has created a series of pieces for the ship, inspired by the landscapes and coastlines of the British Isles. The ship’s library will feature oil paintings devoted to the historic Kent port of Folkestone, whilst its balcony cabins will be dotted with linocut prints of coastal landscapes, including the Stair Hole at Lulworth Cove, a Fife fishing village and a Cornish tin mine. Kent-based artist Kate Knight’s striking images devoted to the natural kingdom will confront guests on deck five. 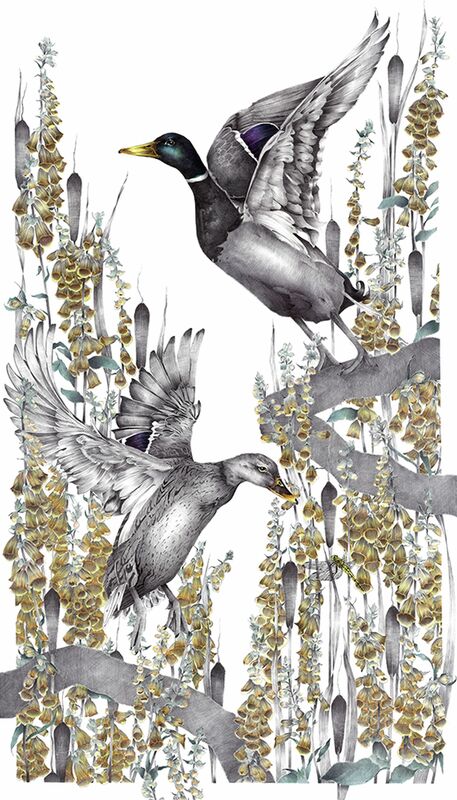 Each of her detailed images features British birds and flowers, including herons with irises, mallards with foxgloves, and magpies with roses – all drawn in black and white, with accents of colour. She says the finished effect evokes the fleeting beauty of nature. The oriental flavours and design of Spirit of Discovery’s Asian dining experience, East to West, are matched by this artwork. Born in China, Jia Chuan moved to London almost a decade ago to study graphic design at Chelsea College of Arts and has remained in the city ever since, commissioned by brands such as British Airways, Starbucks and now Saga. 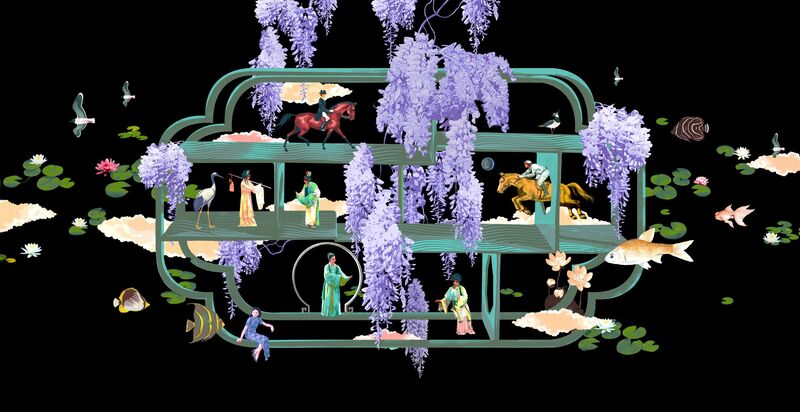 His creative for East to West is deeply influenced by traditional Chinese painting, but he seamlessly integrates digital art and British touches, such as horsemanship, seabirds and wisteria. For more information or to book on Spirit of Discovery during the inaugural season, call 0800 505 030 or visit saga.co.uk/cruise.